Digging little and often is good for both body and mind. As I’m sure you’ll know only too well, digging causes aches and pains, especially if you’re not used to doing it. It is worth breaking up sessions if possible to ease the impact on the muscles. Progress is always a morale booster too, so standing back and being able to admire regularly spruced up sections rather than slogging through hours and hours to cultivate one big section is much better for the mind. It sounds obvious, but get as good and lightweight spade as possible. Old ones found in the corner of the shed are lovely and thrifty, but they’re also often very old, heavy and cumbersome. A nice, light spade will be much easier to turn and far better for the achey muscles. As a kid, I was a bather. As a lazy student, I was also a bather. It seems that having showers is a sign of growing up. When you no longer have time for a bath, and have to shower instead because you’ve got to be at work, then you’re officially a grown up. However, recently I’ve been making time for a long, relaxing bath, particularly on days when I’ve been digging. I grown to love a long bath all over again, and I feel much better in the morning for a soak in the tub. A nice glug of Radox helps too. Digging is a marathon, not a sprint! I can often be found slumped over my spade, recharging the batteries before I get stuck into another row. I did a digging session a couple of weekends ago, on a Saturday that just happened to be the hottest day of the year. It was hard work, and the heat made things twice as difficult. 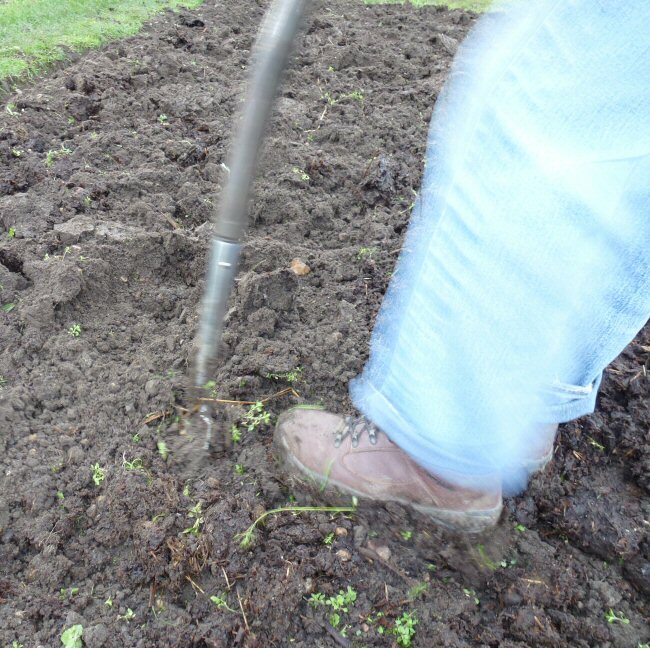 Digging when the ground is dry is also tough going, as getting the spade in to the soil requires much more effort. The same goes for frosty weather too. And digging in the wet is a no-no, as the soil is heavy and sticky. Basically, you need an overcast day that isn’t too hot or too wet or too cold. Clear as mud. Watch out for the earthworms. They’re integral to the condition of the soil and do lots of hard work down there. I like to see plenty of earthworms as it’s a sign of good soil. This might be the best tip I’ve ever got. Another one that sounds obvious in principle, but I’ve often thought ‘oh, I pick them up later,’ and then realise that life is much easier if I do this whilst I go along. I miss half of them otherwise; either treading them back into the soil or being lazy after a hard morning’s digging. All good advice. I had a ladies spade which was actually too short for me as I discovered once I had spend some time digging at the plot and was in agony. Also setting small areas to dig in one go makes it feel as though you have achieved more. Hi Helen, thanks for the comment. I had no idea you could buy ladies spades. They sound a good idea in principle, but sounds like you didn’t get on very well with one.